Product Consists : Love Photo Hanging with Table Top Frame (Approx Photo Size : 3" Height & 3.5" Length) along with 6 Inch Golden Plated Rose. On this Mothers Day take a moment to send your mother a unique lovable message that will remind her of how much you love her Warm wishes for a Happy Mothers Day. Create a wonderful collection of gift for Mom that is as fabulous and unique as she is. 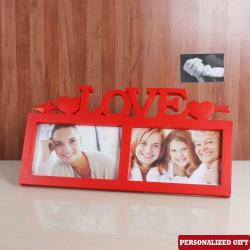 Giftacrossindia.com features a special Love photo hanging frame to showcase your timeless memories. A Photo frame to adorn your table be it a bedside table or an office desk or at table corner of living room this photo frame makes sure you have your memories right in front of you. A perfect gift for a Friend like Mom. Re-live your golden memories by decorating your home with photographs or by gifting this frame to your close ones with special love. Make occasions like Mother's Day, Valentine's, Anniversary, Birthday truly memorable with a picture frame through e-shopping. 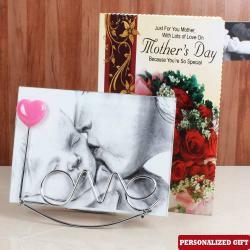 Buy Mother's Day Gifts online from Giftacrossindia.com for her and get this exclusive frame delivery at your receiver door.